Robert C. “Barney” Barnd died in Loveland, Colorado on Wednesday, June 27, 2018. In his life, he made numerous contributions to the Eaton area. There will be an interment ceremony on Friday, Oct. 5, at Mound Hill Cemetery at 11 a.m.
EATON — An interment ceremony for Robert C. “Barney” Barnd will be held on Friday, Oct. 5, at Mound Hill Cemetery at 11 a.m. All who knew him are welcome to attend. 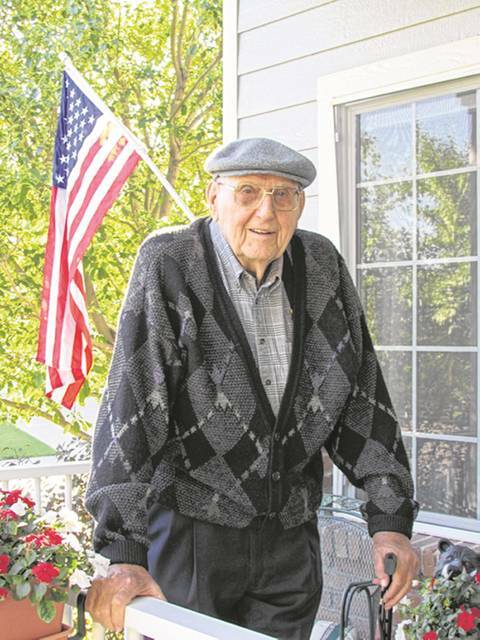 Barnd died in Loveland, Colorado on Wednesday, June 27, at the age of 96. He was born in Manchester, Iowa on Aug. 29, 1921, to James H. and Pauline (Oliver) Barnd. He met the love of his life Dorothy “Dottie” Dobson in Manchester, Iowa. They were married in Chicago, Illinois, April 17, 1943. She preceded him in death. Barney served in WWII in the European operation in the Army 589th Anti-aircraft Automatic Weapons Battalion. He returned home in 1946 with the rank of Captain. He started his business career in Eaton, where he purchased a machine shop which became part of the Parker Hannifin Corporation. Barney’s career continued with Parker until he retired in 1986 after 39 years. He served as General Manager in Eaton, and Otsego, Michigan. Barnd wrote “The Parker Story,” in which he tells his own history with Parker and the City of Eaton. “My career in manufacturing began when our families joined together with financial help, allowing us to buy 40 percent of Eaton Screw Products from the estate of its founder Horace Justice. Two years later, we accepted an offer from our customer Parker Appliance Company to buy the company and I remained as manager for the next 12 years. This was the beginning of my 39 year carrier in business with Parker and a life of incredible opportunity and reward,” he wrote. “Eaton was good to us. I joined the Rotary Club, was elected to the city council, was the ladder captain on the volunteer fire departmentand started the Eaton Chamber of Commerce. How did we get into the manufacturing business? In December of 1948 Horace Justice, the owner of a 15-man, war baby, manufacturing plant had a federal tax problem which he spent a day resolving, went home, had dinner, sat down to read the paper, and died. “The government ignored the agreement they made with him that day and put together a plan of foreclosing and/or liquidating the company to get their tax money or sell it as a going business. To make this a short story, two other business men, Ed Steffen, Karl Brouse and I met with Mr. Justice’s attorney, Thurston Biddle, and the right people, and bought the company at a price that exceeded the individual bids that would have closed the business down. He attended Harvard’s 43rd Advanced Business Management Program in 1963. Barney continued his career path to Cleveland, as Group Vice President, London England as President of European Operations and in 1978 returned to Cleveland as President of International Operations, Vice President of Parker Hannifin. In retirement, Barney participated in several organizations; SIRS (Sons In Retirement-Fresno), SCORE International Fresno, Fresno City Planning Committee, Center for Abused Women and Children-Fresno and Fresno Philharmonic. Automobiles played a large role in his life beginning after military service selling and servicing Packards and Studebakers. He collected classic automobiles and became the chairman of The Greater Valley Concours d’Elegance car show in Fresno for 16 years exhibiting museum quality automobiles from all over the country. https://www.registerherald.com/wp-content/uploads/sites/41/2018/10/web1_GetFileAttachment.jpgRobert C. “Barney” Barnd died in Loveland, Colorado on Wednesday, June 27, 2018. In his life, he made numerous contributions to the Eaton area. There will be an interment ceremony on Friday, Oct. 5, at Mound Hill Cemetery at 11 a.m.